Organization of such a ceremony is a reflection of good relations between Iranian and Italian artists, said the director of Tehran Museum of Contemporary Art. 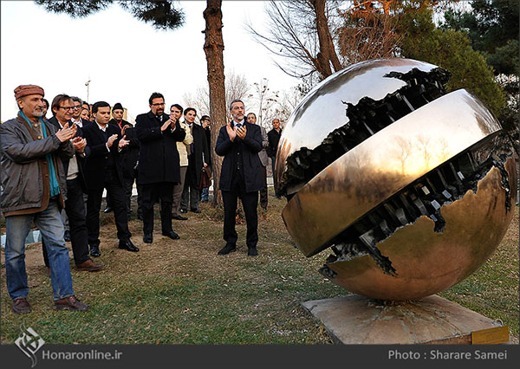 The Sphere, a sculpture by Italy’s Arnaldo Pomodoro, was unveiled at Tehran Museum of Contemporary Art with Director of the Visual Arts Center Majid Mola Nouruzi, Italian Ambassador to Iran Mauro Conciatori, Mazdak Feiznia representing the Feiznia Foundation, Hamid Ayni, a sculptor, a representative of the Pomodoro Foundation and a number of visual arts enthusiasts in attendance. Arnaldo Pomodoro, an Italian sculptor and artist, was born in the Italian city of Morciano in 1926. At present, he lives in Milan. The artist is well known for his spherical and columnar sculptures. Some of his works are on display in the Vatican Museum, Trinity College, Dublin, the United Nations Headquarters in New York, the Hirshhorn Museum and Sculpture Garden in Washington D.C, Christian Theological Seminary in Indianapolis, the de Young Museum in San Francisco and the University of California, Berkeley. Of his artworks in Iran, one is on display at Tehran Museum of Contemporary Art; another is housed in the library of Niavaran Palace; and a third stands outside the parking lot of Eram Amusement Park.